Special thanks to Olive Tree Hotel for extending this food review invitation. 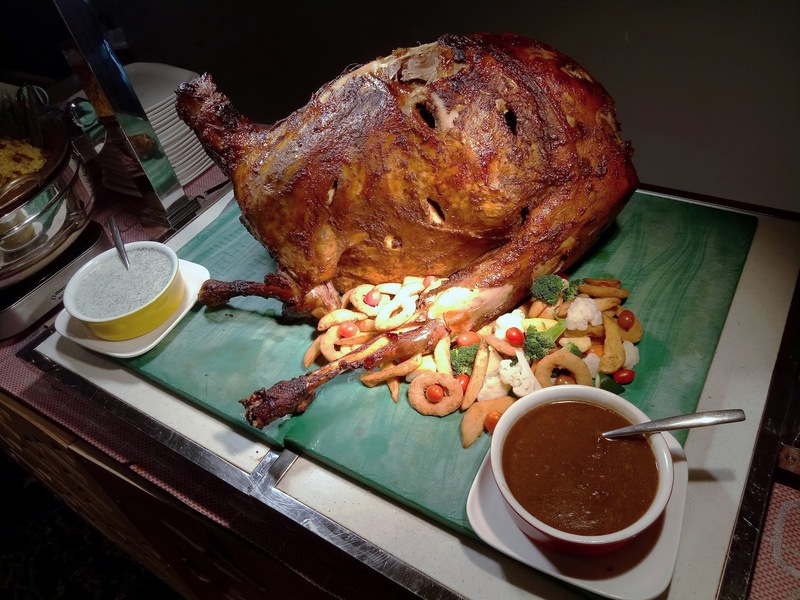 Olive Tree Hotel is rolling out a new buffet menu for Ramadan. 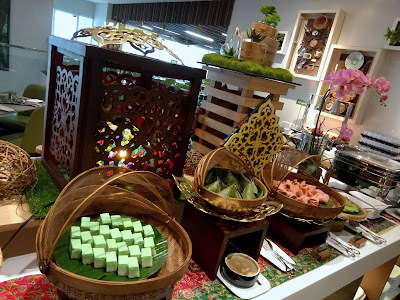 Served at Sukkah Coffee House, the buffet's theme is "Selera Nusantara Ramadan". 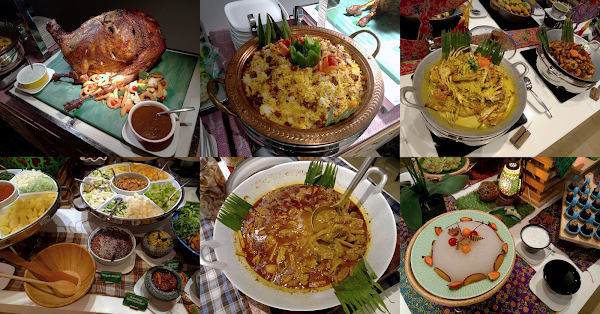 Besides traditional dishes from the Malay Archipelago, the menu also covers Penang street food and Arabic cuisine. The main highlight during today's preview event is Kambing Bakar. A whole goat is marinated for several hours to ensure that the meat becomes flavorful. The mutton is served with assorted vegetables, onion rings and potato wedges. Black pepper and mint yogurt sauces are prepared too. 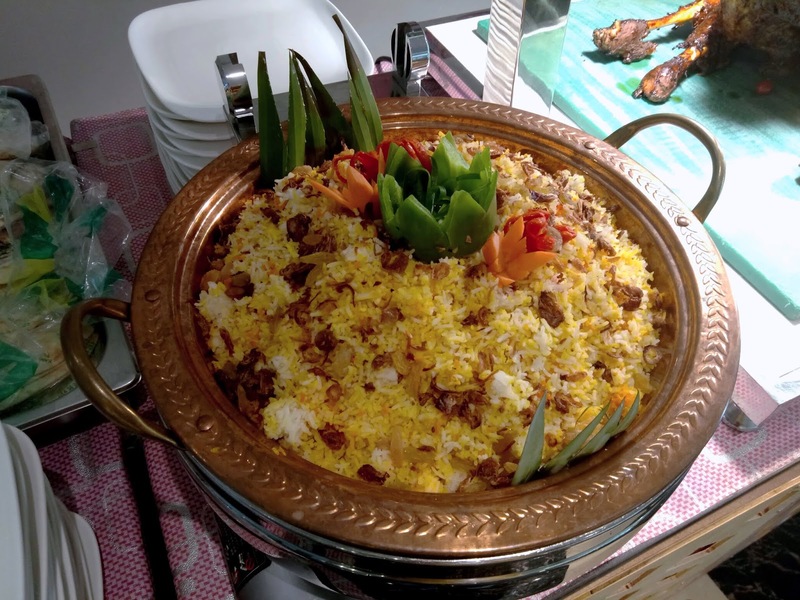 Next, Nasi Mandi is a traditional Yemeni rice dish that is also popular throughout the Middle East. 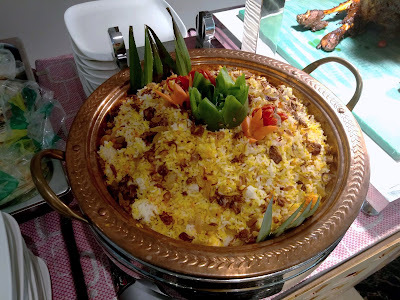 Basmati rice is cooked with a special blend of Arabic spices, and then garnished with fried shallots and raisins. The rice is aromatic and flavorful. I cannot recommend it highly enough. 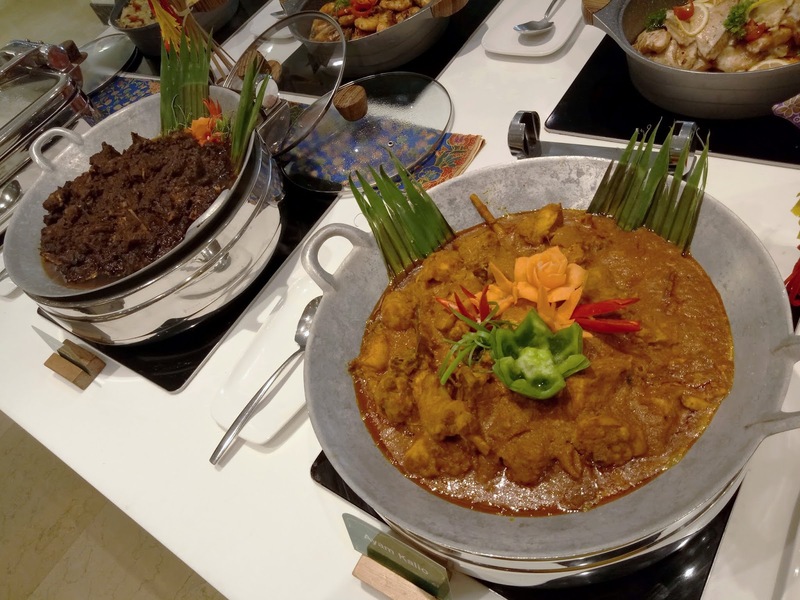 Another notable highlight this evening is Gulai Daging, where beef is stewed with coconut milk and spices in a large wok called "kawah". The spicy stew contains pieces of batang pisang (coconut stems); their texture is similar to that of bamboo shoots. As for poultry, Ayam Kalio is a Minangkabau dish from Padang, Indonesia. 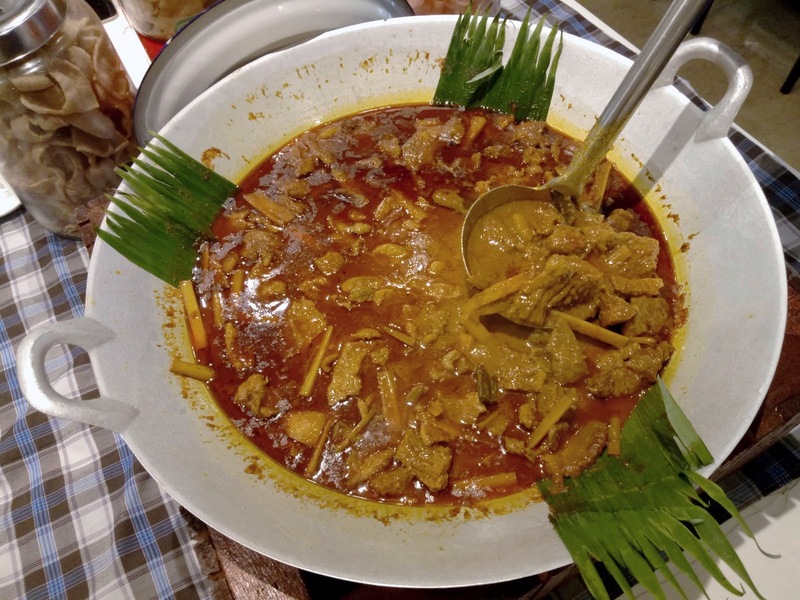 Kalio appears somewhat similar to rendang but contains more liquid. Should you prefer red meat, Kambing Kerutuk is a mutton dish of Kelantanese origin. Speaking of seafood, Ketam Masak Lemak is probably the most prominent dish in this category. 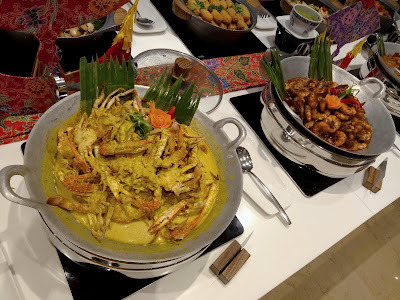 The flower crabs are cooked in a sauce that is rich in coconut milk and turmeric. Cili padi (bird's eye chili) is also added. 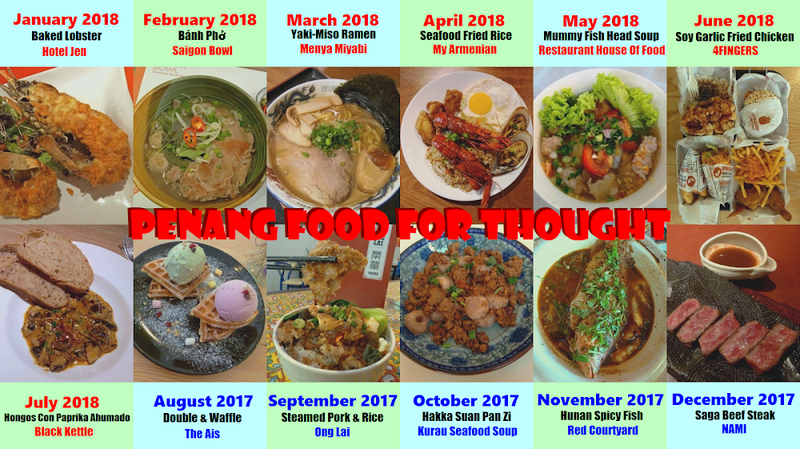 Meanwhile if you fancy stink beans, go for some Sambal Udang Petai. 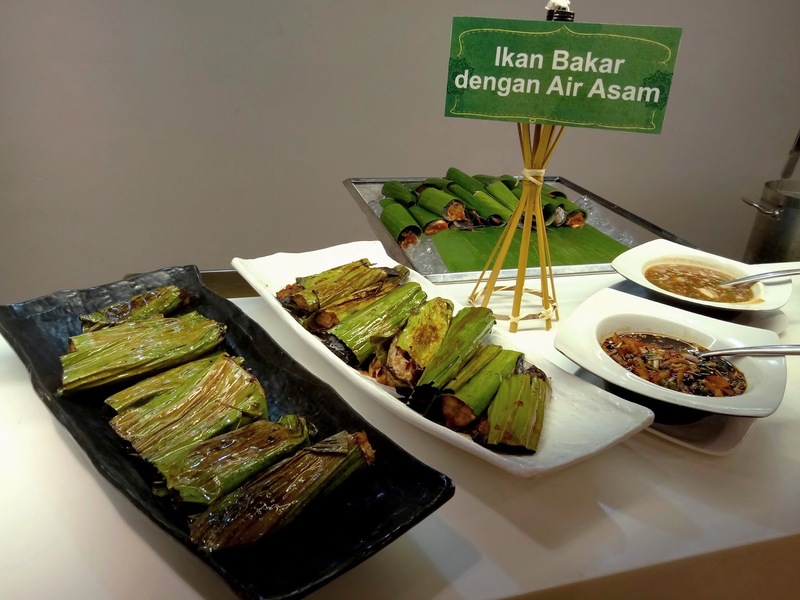 The Ramadan-themed menu also covers dishes from other cuisines. 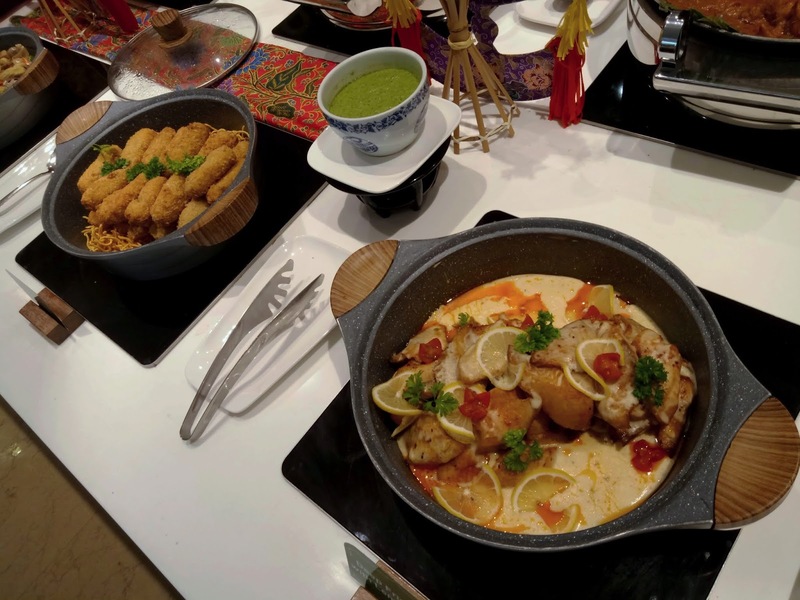 For instance, Deep-Fried Fish is flavored with Chinese-style lemon sauce. This dish is suitable for children because the fish is deboned. Ikan Bakar (grilled fish) is prepared at the action counter. There are two choices of fish this evening: ikan keli (catfish) and ikan pari (stingray). 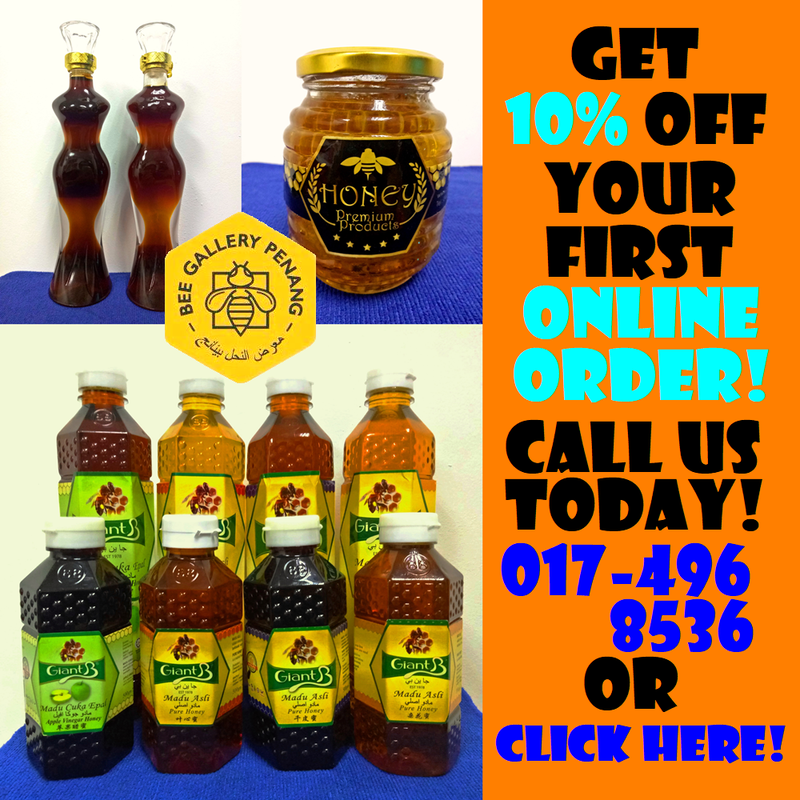 Air asam (tamarind sauce) and sambal kicap (spicy soy sauce) serve as condiments. 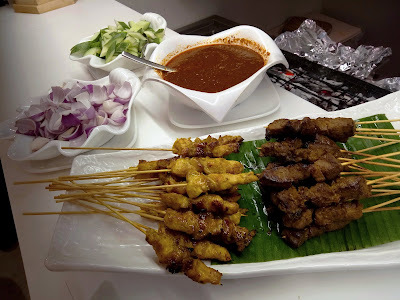 Satay is well received by most people, which explains why it is depleted quickly. As per tradition, satay is best enjoyed with spicy peanut sauce, shallots and cucumber. 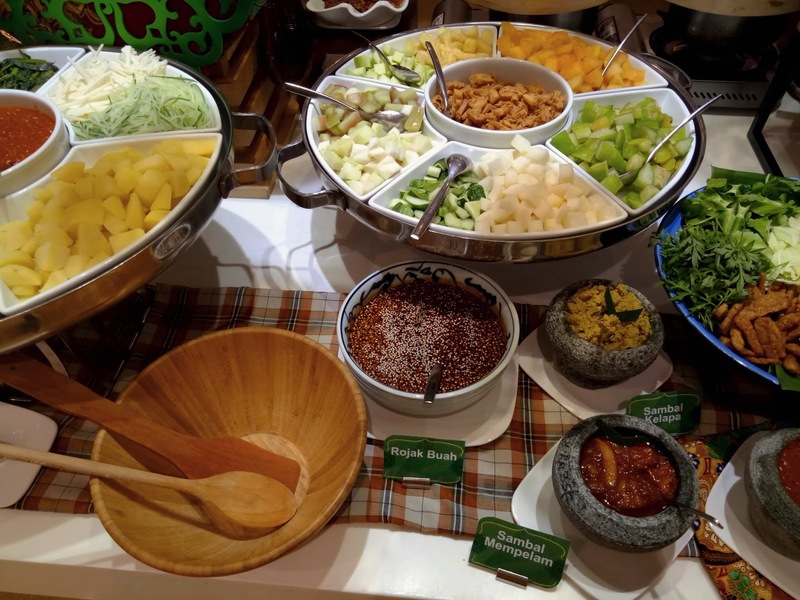 Moving on to the salad counter, Rojak Buah is a mixture of diced fruits like jambu batu (guava), jambu air (rose apple), sengkuang (jicama), belimbing (star fruit) and more. The fruit salad uses a sweet, savory and spicy dressing that is based on shrimp paste (belacan). I am pleased to see the assortment of Malay kuih in rattan baskets. The kuih choices this evening are Kuih Seri Muka, Kuih Lapis, Kuih Cara, Kuih Ketayap and Abok-Abok. 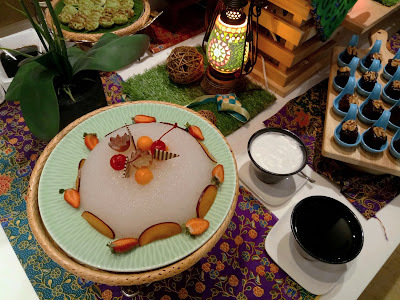 Sago Gula Melaka is a translucent pudding made from sago pearls. This traditional dessert is nearly tasteless on its own, so it is usually consumed with gula melaka (palm sugar) and coconut milk. 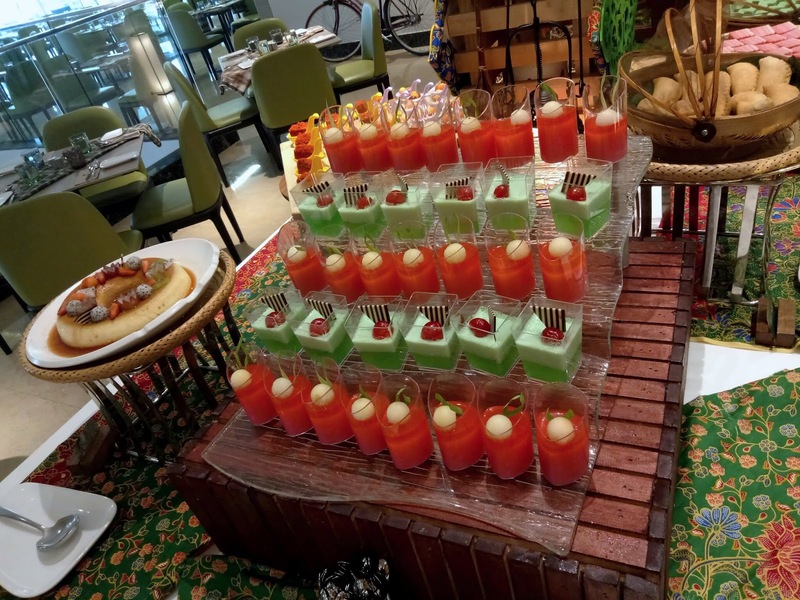 As for Western-style desserts, the pastry team has prepared Fruit Jelly, Crème Caramel, Red Velvet Cake, Chocolate Moist Cake, Fruit Tarts and Cream Puffs. 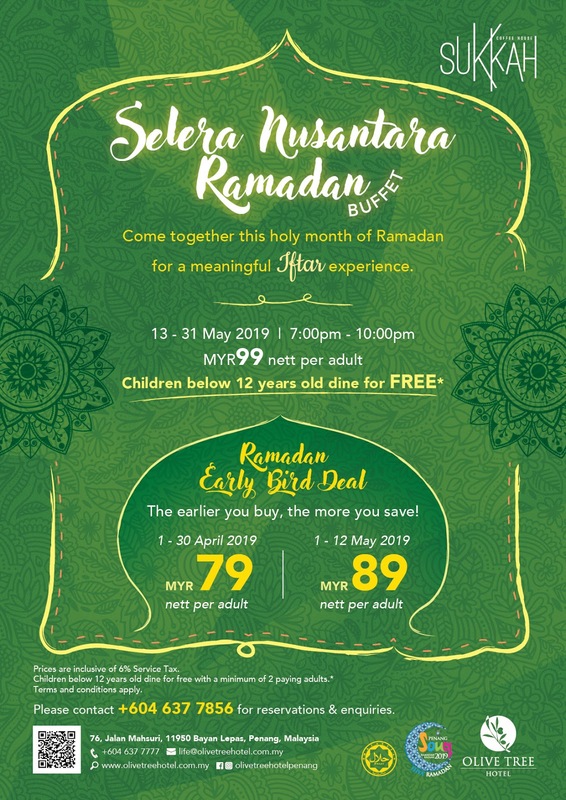 Olive Tree Hotel's Ramadan buffet dinner is held every evening from 13 May 2019 to 31 May 2019. The buffet price is RM99.00 net per adult. Children below the age of 12 dine for free. Early birds vouchers are available for discounted prices. The vouchers serve as perfect gifts. Directions: Olive Tree Hotel is located at Bayan Baru, just across the street from SPICE Arena. Sukkah is located at Level 1, just above a flight of elevator from the lobby. The hotel's multi-storey parking charges RM3.00 for the first hour, then RM1.00 for each subsequent hour.